General class info, weapon statistics, character unlocks (items and hats), basic strategies and advanced strategies for the Pyro in Team Fortress 2. Special Abilities: Compression Blast: Alt-fire. Reflects projectiles, launches back enemies and puts out teammates that are on fire. Special Abilities: All damage done to enemy from behind is critical damage. No compression blast. Taunt: Close range instant kill. 3 second warm-up. Special Abilities: Sets enemies aflame. Will mini crit targets already afire at medium range and will critical hit those already afire at longer ranges. Special Abilities: Weak damage applies to non-burning targets (except buildings), however it will always critically hit any target that is aflame. Special Abilities: Weapon can be used to remove enemy sappers in just one swing. A sadly often overlooked ability in public games. The compression blast can reflect projectiles (rockets [including sentries], grenades/stickies, baseballs, jarates, arrows, and flares) back at the enemy causing mini crit damage, already making the Pyro quite an annoying enemy for most classes to deal with. Add to that the blast's ability to put out teammates that are on fire, and the ability to push enemies away over ledges or skywards to begin juggling, which is quite annoying for them when they are on fire and unable to move anywhere. You can also use it to separate a medic and his target. The ultimate spy checking class. Puffs of flame here and there in your base can keep your engineers and buildings safe, while quick squirts of flames in corners or along standard spy paths can keep your base warm and spy-free. It's also quite handy when you find a teammate acting suspicious, or to help protect the members of an assault from getting backstabbed. 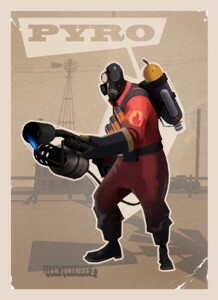 The ability for the Pyro to use the Homewrecker sledge to remove enemy sappers makes him that much more of an anti-spy tool. This one's quite simple and rarely used. A quick blast from your flamethrower to your primed snipers will set their arrows on fire, causing the enemy to be set ablaze and suffer afterburn damage when hit. Use ambushes with doorways and corners to maximize the close-range damage from your flamethrower. Don't worry about retreating from battle if needs be, as the enemy will most likely burn to death from the afterburn damage if you got a good couple seconds of flaming in. When at longer ranges or finding yourself in water, use the shotgun to tune the enemy until you can get close enough for flaming or to dry ground.